Despite protest leader turned Armenian Prime Minister Nikol Pashinian’s framing of the protests as an internal issue – not a geopolitical one, and certainly not anti-Russian – many feared Russia would treat the transition as a Western-fomented “colour revolution,” and would lead to direct Russian interference. This however did not happen. This fact supports work done elsewhere about how, contrary to popular belief, Russia does not go around destroying democracy as a foreign policy objective, but rather works according to another logic – maintaining Putin’s regime. It also may be that Armenia’s settled status as an EEU member blunted criticism that the new government was inherently anti-Moscow. At the same time, membership in the EEU was expected to present obstacles to democratization for member states that would be all but impossible to overcome. The EEU, established in January 2015 to create a shared economic space with a single customs union, was a more advanced iteration of the Eurasian Customs Union founded in 2010 with Russia, Belarus, and Kazakhstan. With Armenia and Kyrgyzstan joining in January and August 2015, respectively, the union began to fulfil its implicit role as a Eurasian alternative to the European Union. For Russia, the EEU served as a framework for providing, often coercively, states of the former Soviet Union a geopolitical choice between the West and Russia. This geopolitical choice is also one between two very different value systems. EU accession frameworks provide broad democratizing incentives, while the EEU has no such requirements. Joining the EEU can be done much more quickly and simply than the long-term process required to maybe someday accede to the EU. Thus, the EEU is a convenient way for many authoritarian and semi-authoritarian elites in the region looking to sell short-term geopolitical successes through regionalization to their constituents without being forced to dilute their power through democratic reforms. Indeed, the EEU can be described as a network of autocrats, and membership is often seen as reinforcing corrupt and opaque political tendencies among member states – many of which already have low standards of legal culture, and poor ratings for democracy, human rights, and governance. This negative synergism created by greater reliance between members within the organization has been anticipated to further isolate these countries geopolitically from potentially democratizing external influence. How then was Armenia, a three-year member of the EEU, able to pull off a democratic revolution? Of course, Armenia was unique in the EEU in that it was neither fully autocratic nor fully democratic, in contrast to other member states that are more solidly authoritarian. 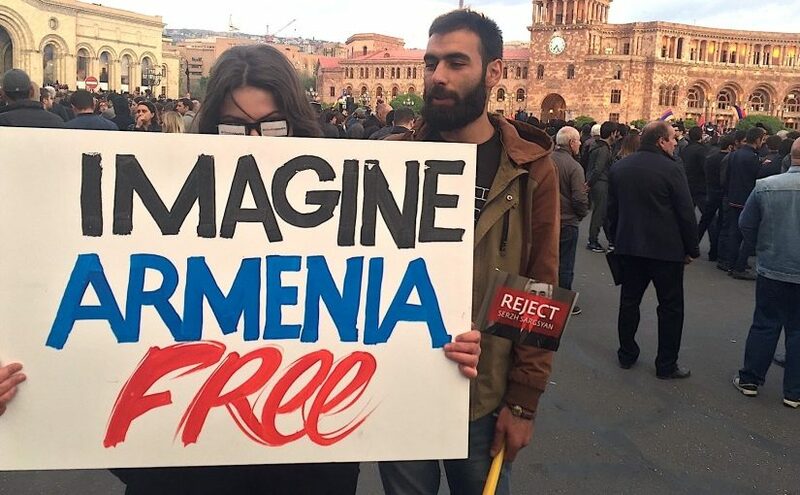 Armenia’s social media space was exceptionally free for the region; and Armenian civil society was robust and active, with strong networks of young activists. At the same time, Armenia as an EEU member state was being increasingly isolated geopolitically from the West and its democratizing incentives. The EEU ties Armenia even more closely to Russia economically and in terms of security. Armenia cannot pursue its own trade policies with other states without the approval of the other EEU member states. However, none of these factors seemed to present insurmountable obstacles to democratization for Armenia. This adds more evidence to support Kateryna Wolczuk and Rilke Dragneva’s research on the EEU and in particular their assertion that “satisfied with having created a union, Russia is not preoccupied with making it work.” Their analysis of the common institutions of the organization reveal that they are made deliberately weak in order to minimize disturbances to domestic institutions and policies of the member states. To put it another way, the EEU, and the security-oriented Collective Security Treaty Organisation, are institutional extensions of Russian power, and are purposefully kept weak to ensure Russian leadership. It may be that the surprise regarding Armenia’s ability to manage a democratic revolution was based on popular assumptions among observers and analysts that democratization in the former Soviet space is only possible through a sort of EU democratizing playbook, with direct support from European institutions. In this analysis, membership in the EEU would preclude that. Armenia’s case, however, shows that if the domestic ingredients for a revolution are there, in particular media freedoms and civil society strength, the authoritarian incentive structures within the EEU do not have the capacity to necessarily prevent democratization or related reforms. Dr. Karena Avedissian is an EDSN fellow and a political scientist focusing on social movements, new media, civil society, and security in the former Soviet Union, with an area focus on Russia and the Caucasus. EDSN is an international research fellowship project of the Center of Social Sciences, Tbilisi, and made possible with the support of the National Endowment for Democracy.